As I write, it is just a week since my return from Rome where I joined in celebrating the Golden Jubilee of the Catholic Charismatic Renewal with more than 200 Australians and 30,000 others from all around the world. 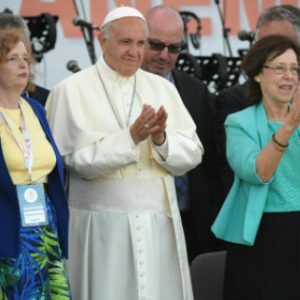 That number does not include those of other denominations and Pentecostal groups who were also invited by Pope Francis to this momentous celebration. Given the opportunity to attend the Rome event I asked myself: “Why do I want to go?” Really, it was to give thanks to God for the many graces and blessings I have received from CCR since my introduction to it in 1976 at the second prayer meeting held by the group in the Wollongong Diocese. 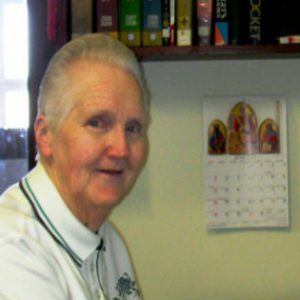 Since then, through the ministry of Sr Briege McKenna, I have experienced the healing love of Jesus in my own life in 1986 and subsequently witnessed that same love touching the lives of others through the ministry of healing power in which I continue to be involved. Yet this wasn’t just about me, but also about all whom I know and have ministered t and with over the years – my Sisters of Charity religious congregation, the Australian Catholic Charismatic Renewal… Yes, you were all with me there in Rome witnessing the most powerful expressions of unity imaginable. People from every country, all languages, shapes and sizes, together in unity, praising and worshipping God, one in mind and heart, in unity of purpose, moving beyond the differences and joining together in that unique gift of praising God. On my return, someone from the CCR Centre asked me: “What did you learn?” That stumped me for a moment, because I hadn’t gone to learn, but rather to experience. 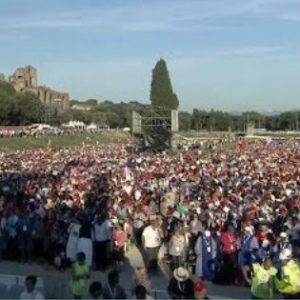 And that was a reality at Circo Massimo on the eve of Pentecost for, while my mind was not comprehending the Italia, the responsive atmosphere around me spoke volumes. Then when Pope Francis proclaimed in English, Jesus is Lord!” the stadium erupted on one great burst of joy. That’s how it felt for four days of preparation for Pentecost itself. It seemed that lack of unity in the one language was compensated for by a spirit of unity n the one spirit, the Holy Spirit. There was unity in joy, respect, reverence. I experienced kindness, thoughtfulness and friendship hard to imagine in such vast, compact gatherings. Dare I say it was a little touch of heaven although I could have done without the 30 plus degree heat. And so – what have I come home with? A renewed and deep desire for unity, particularly unity within our own Church; within CCR; and indeed, wherever unity in the body of Christ has been fractured. Pope Francis also spoke of unity at Pentecost vigil in terms of Christian unity and that morning, attending a session at the Urbiana University entitled CCR: A current of grace for the whole Church, I heard people such as Charles Whitehead (from England and former ICCRS President), Fr Raniero Cantalamessa ofm Cap. (preacher to the Papal household), Fr Hocken and Vincent Synon together with two Messianic Jews who shared their remarkable stories and marvelled at their being seated between two Catholic priests. There is so much more which could be said about the whole experience not least of all was the interaction with ordinary Romans, including at the Pantheon one particular very handicapped man whose face shone with a smile which was contagious. It is etched in my mind. I thank God for him and each and every moment which was total gift and blessing. Image of the Holy Father from Alateia.